If you could take a gold mining project, with all its gold, all its costs, and all its incomes, and process the entire thing in 30 seconds – how much would you be left with? That amount would be the NPV! Obviously, we cannot achieve such a feat, so instead we work out all the costs and incomes that would be associated with the project over its life time, and we are then left with the NPV. 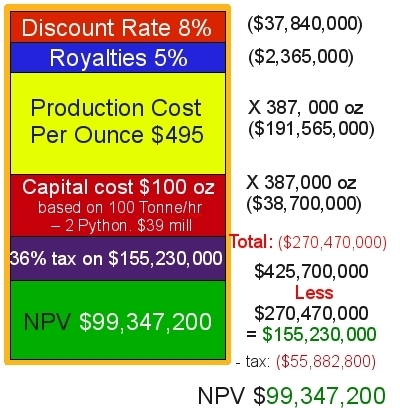 The bottom line is that if the NPV is greater than 0, then the project is a go!. It’s profitable and worth the risk. If the NPV is less than 0, it is not worth the risk. I have placed a link below to a site with an NPV calculator. For this exercise I am going to use Republic Gold (asx RAU) figures. These have now changed, but will still illustrate the principles. You can apply these steps to any company you are interested in checking out. In addition to this rate, you need to add a “risk factor” percentage. This will vary according to the level of risk you associate with the project. Let’s add another 3% for risk. Now, we will begin to diagram this. 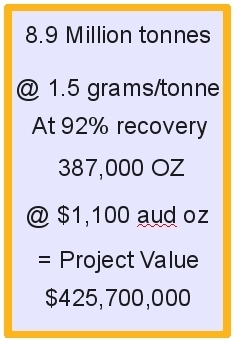 I am going to base my illustrations on 430,000 ounces contained in 9 million tonnes at a grade of 1.5 grams per tonne. This is approximately RAU.s early BFS on its Amayapampa project in Bolivia. Just for interests sake, you could now take the total number of shares in RAU, and divide it by the NPV. And hey presto: You have an EVO of $15.00. At 2 cents per share RAU had an EVO of UNDER $10 per ounce. Barely value for Amayapampa based on the old BFS. What about the other projects? You can jump to the page on EV and EVO Here. NPV = 0 does not mean that a project is only expected to break even, in the sense of undiscounted profit or loss (earnings). It will show net total positive cash flow and earnings over its life. Also, I was going to update this page with new figures, but there is so much work in re-building my illustrations, I have not done so. RAU have a great BFS update out, and this can be applied to the steps above. The main thing is that the steps are there for you to apply to any company you wish. I hope these pages have been useful. If you have any comments or questions just contact me through my contact page and I will be happy to dialog.